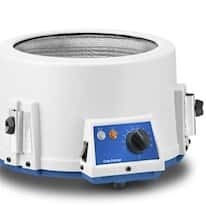 Lab heating mantles are used to uniformly heat various lab and glassware vessels. If you are looking for an accurate and easy-to-use heating solution, a lab heating mantle is a good alternative to heating baths. A lab heating mantle is even great for hard-to-fit flasks and funnels. Choose from flexible fabric or canister-style lab heating mantles. Both types incorporate a flexible and insulated heating device which allows you to place your containers directly on the heating element without substantially increasing the risk of the glassware shattering.